Move oven rack to highest position. Heat oven to 375°F. Spray cookie sheet with nonstick cooking spray. Do not unroll dough. Place dough on sprayed cookie sheet. Starting at center, press out dough with hands to form 14x5-inch rectangle. 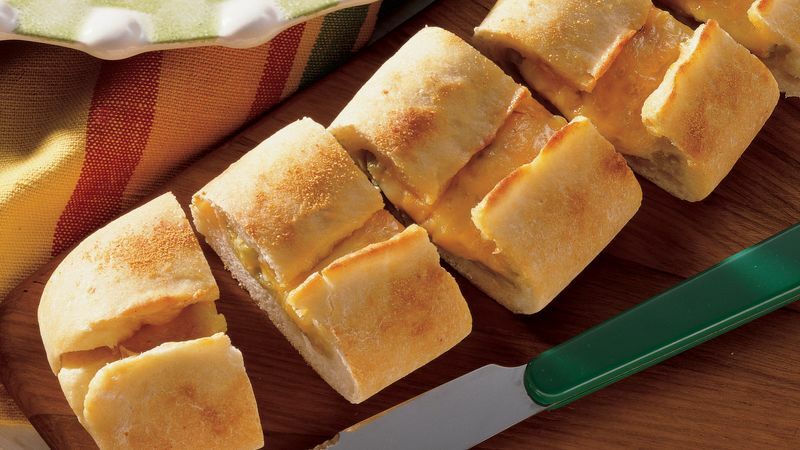 Sprinkle chiles and cheeses over dough to within 1/2 inch of long sides. Bring long sides up over cheese; pinch to seal. Pinch ends to seal. Sprinkle with garlic powder. Bake at 375°F. on highest oven rack for 15 to 20 minutes or until golden brown. Cool 15 minutes. Cut into slices. Serve warm.